S-IB launch vehicle stage fuel (RP-l) loading was completed satisfactorily on July 23, 1975. Countdown demonstration test preparations have started and the nine-day test will start at 0700 EDT on June 25, 1975. Three days later, Lunney and Bushuyev discussed a variety of topics, including the joint control center simulations scheduled for the end of the month and some public affairs questions.66 Meanwhile, the astronauts continued their training. 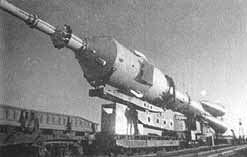 The Soyuz launch vehicle and ASTP spacecraft are transported to the launch site by railroad flat car (Soviet Academy of Sciences photo). ....specialists led by Charles R. Lewis arrived at Moscow Sheremetyevo Airport on the 12th, where they were met by V. G. Kravets, V. D. Blagov, and S. P. Tsybin, members of the Soviet ground control teams. ** With everyone in place, Chet Lee conducted the "L - 2 Day Review" to determine whether all systems were set for launch.71 Gulick could give a reasonably favorable weather forecast - broken clouds, wind out of the east southeast at 10 knots, a temperature of about 29°C, with about a 70-percent change of thunderstorms. All stations reported that they were ready to go. * O. I. Babkov headed the delegation, which included S. G. Grishin, Deputy Director of MCC-M for Information; V. V. Illarionov, CapCom; A. S. Korolev, onboard systems specialist; V. V. Kudryavtsev, docking systems specialist; V. K. Novikov, life support system specialists; I. P. Shmyglevskiy, control system specialist; V. I. Staroverov, flight controller; V. D. Yastrebov, trajectory specialist; G. I. Kharitonov, Intercosmos; B. S. Kunashev, Space Studies Institute; and interpreters, B. P. Artemov, Y. N. Sergeyeva, and O. G. Yavorskaya. ** C. R. Lewis headed the delegation, which included R. F. Overmyer, Capcom; R. L. Haken, control system specialist; R. W. Becker, trajectory specialist; J. A. Kamman, guidance and navigation specialist; J. S. McLendon, electrical and instrumentation specialist; R. L. Grafe, ECS specialist; J. E. Riley, F. G. Williams, and A. P. Alibrando, public information; and interpreters J. O. Glikman, I.A. Mamantov, A. Rodzianko, T. Krivosheim, and K. Javorskaya. 65. TWX, Lunney to Bushuyev, "Apollo Status Report," 23 June 1975. 66. "Minutes of the ASTP Telephone Conversation [U.S. Minutes]," 26 June 1975; and "Minutes of the June 26, 1975 Telephone Conversation between Lunney and Bushuyev [USSR Minutes]," 26 June 1975. 67. NASA News Release, JSC, 75-59, "ASTP Crew Begins Medical Isolation," 24 June 1975; [NASA News Release, KSC (unnumbered)], "ASTP Prime Crew Activities," 25-29 June 1975; and data supplied by Mike S. Brzezinski. During CDDT, excessive leakage was discovered in the suit loop of the spacecraft while in the low pressure (vent) mode, although no leakage was evidenced at high pressure (3.75 psi). Troubleshooting conducted in the spacecraft isolated the problem to Astronaut Brand's suit. Following completion of CDDT, Astronaut Brand's flight suits were returned to JSC where additional failure analysis established the source of this low pressure leak to be in the crotch radius area. The leak is induced when the crewman is tightly strapped into the couch position causing the zipper sealing lips to unseat. After examining several possible corrective concepts, a zipper insert [made of vinyl tubing] was designed which can be placed between the sealing zipper and the donning assist zipper thereby preventing the sealing lips from being unseated by the couch position condition. Certification tests of the zipper insert have been conducted to verify its acceptability for flight and to assure no adverse effects on use of the suits in the pressurized mode. Vance Brand had also fit checked his suits with the insert installed to verify acceptability. 69. [NASA News Release, KSC (unnumbered)], "ASTP Prime Crew Activities," 30 June-7 July 1975; TWX, Lunney to Bushuyev, "Apollo Status Report," 2 July 1975; [NASA News Release, KSC (unnumbered)], "Status Report ASTP-2," 4:30 p.m., 7 July 1975; [NASA News Release, KSC (unnumbered)], "ASTP Apollo Crew Activities," 7-8 July 1975; [ASTP News Release, KSC (unnumbered)], "ASTP Apollo Crew Activities," 8-15 July 1975; [NASA News Release, KSC (unnumbered)], Status Report ASTP 3," 8:00 a.m. EDT, 8 July 1975; [NASA News Release, KSC (unnumbered)], "Status Report - ASTP #4," 4:30 p.m., 8 July 1975; [NASA News Release, KSC (unnumbered)], "Status Report ASTP 5," 8:00 a.m., 9 July 1975; TWX, Lunney to Bushuyev, "Apollo Status Report," 9 July 1975; and data supplied by Brzezinski. See also TWX, Lunney to Bushuyev, "Apollo Status Report," 10 July 1975. 70. [NASA News Release, KSC (unnumbered)], "Status Report ASTP #12," 2:00 p.m., 11 July 1975; [NASA News Release, KSC (unnumbered)], "Status Report ASTP #14," 5:00 p.m., 11 July 1975; [U.S.S.R.], Press Bulletin No. 1, "ASTP Mission Events," 12 July 1975; [NASA News Release, KSC (unnumbered)], "Status Report #15," 9:30 a.m., 12 July 1975; [NASA News Release, KSC (unnumbered)], "Status Report ASTP #16," 2:30 p.m., 12 July 1975; [NASA News Release, KSC (unnumbered)], "Status Report #17," 5:00 p.m., 12 July 1975; [U.S.S.R.], Press Bulletin, "Two Days before the Liftoff," 13 July 1975; and A. I. Ostashev and N. I. Zelenshikov, "Soyuz 19 u poroga orbitiy" [Soyuz 19 on the threshold of space,] in Soyuz i Apollon, pp. 235-244. 71. TWX, Vladen S. Vereshchetin to Lunney, 7 July 1975; [NASA News Release, JSC (unnumbered)], "USSR Academy of Sciences ASTP Delegation for Mission" [n.d.]; [U.S.S.R.], Press Bulletin No. 3, "Two Days before the Liftoff," 13 July 1975; and [NASA, Apollo Program Office], "USA Specialists in Moscow during ASTP Mission" [n.d.].